THE BOOK: THE DEVIOUS MR. MISCHIEViOUS. SUMMARY: MR. MISCHIEViOUS is the misunderstood and eccentric recluse of the neighborhood. No one is quite sure what MR. MISCHIEViOUS is all about. His dress definitely makes him mischievous, as he wears a long trench coat and over-sized hat, complete with a comical moustache. It doesn’t take long before MR. MISCHIEViOUS finally gets bored with his environment and one day, comes out of hiding unleashing his ‘artistic talents’ upon the unsuspecting neighborhood. This gets him into some trouble, and as everyone in the neighborhood retaliates, they find out what MR. MISCHIEViOUS really is all about, and why he spends all of his time inside his home. The start of this book left me wondering where it was going to end up. It is a fun story, and full of rhymes, and actually reminds me of a Dr. Seuss book. Mr. Mischievious is a very busy man, who is creative and running out of space! I can’t wait to read this with my granddaughter. Very fun story line, and a lot of creativity for young minds. This is such a fun book! It would be great for any child that is learning to read or loves someone reading to them. The book is exciting and your not quite sure what Mr. Mischievious is going to do next. This book is very enjoyable, funny, and lighthearted. My children love it and have read it over and over. You will NOT regret this book! The Devious Mr. Mischievous is a great book. It will keep you entertained while you are reading it. Mr. Mischievous does get into some trouble, but it’s all in good fun. I would recommend this book to anyone who wants to just enjoy reading something light-hearted. It made me laugh several times and it had a a good ending. AUTHOR PROFILE: Scott Schafer was born in 1979 and resides outside of Pittsburgh, PA. Since he could hold a pencil, he liked to draw and create different characters and cartoons. Never a writer, Scott wanted to illustrate and write a story he could share with his young son. After discovering a hidden talent, Scott wrote ‘Furry Weather and a Storm of Feathers’, his first illustrated children’s book. Other endeavors, including acting and performing sketch comedy got in the way of completion of this book and finding a way to publish it. Discovering self-publishing for his work finally opened the door to completing the story. Upon satisfaction of completing this book 14 years after it was created, and published in 2014, Scott found a desire to continue writing and illustrating children’s books, and plans many more titles in coming years. 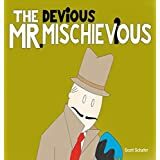 AUTHOR COMMENTS: Much of a character with hidden and talents unknown to others, the DEViOUS MR. MISCHIEViOUS carries a lot of my characteristics. Next Next post: Unsafe on Any Campus?